It rained Friday night, so on Saturday morning - 9AM sharp - we fired up the torches and got to scraping. A really well-prepped drag strip is a thing of temperamental beauty. Ideally, it is a layer of concrete, topped with a thin and perfectly smooth layer of fresh rubber, topped with copious amounts of glue. It does not remain in this ideal state for long. Things like humidity, temperature changes, and cars with street tires can alter this perfect balance in disastrous ways. Rain, in particular, is our worst enemy. Obviously it can make the track slick and unusable but it also seeps under the thin layer of rubber mentioned above. 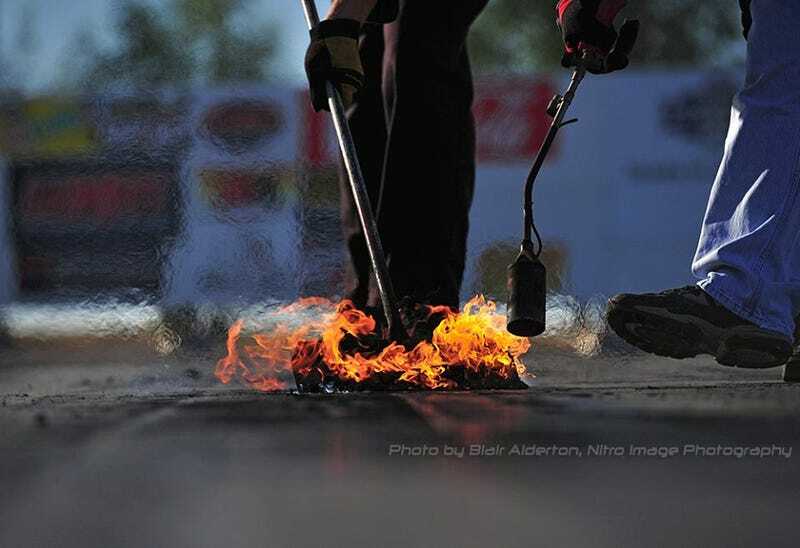 When the track is heated - either by the sun or by cars running - the water evaporates and expands, creating bubbles that break through the rubber and ruin the surface. So when it does rain, we have to speed this process up and reverse it before cars can run. We do this by firing up a large propane torch to melt the rubber and boil the water underneath simultaneously. We then use a large metal blade to scrape the rubber off the surface, being careful not to scrape all the way to the concrete below. This exposes the new, fresh rubber beneath the surface and eliminates the water simultaneously. Success! Now, repeat this hot, smelly, back-breaking task over an area perhaps 15 feet across and roughly 50 feet long. The scraper blade is only a foot across, so you'll need to make quite a few passes to cover an area. After you complete a section, pick everything up and move down track to do it all again. Repeat for as long as needed in order to ensure safety and a good surface for the cars. For four guys, this generally means at least an hour to cover the first 100 feet of the track. Then, once the track has been scraped, it must be prepped again. Drag slicks are pulled over the surface to lay down that thin coating of fresh rubber that is so vital to maintaining grip levels. after the surface is sufficiently coated, the whole thing i sprayed with glue. The result is a surface so sticky that it is not unusual for people to literally step out of their shoes when it is warmed up. When I first witnessed and participated in this process, I scoffed a little at how ridiculous it was. For Christ's sake, F1 cars run on street circuits and in the rain. What makes these guys so special that they need such a perfectly groomed surface to race? The answer is actually pretty simple. Horsepower. No other form of racing values that ancient form of measurement quite so much as drag racing. Obviously. Still, the simple nature of the sport means that enormous amounts of power are going to be transmitted to pavement extremely quickly, and if said pavement cannot provide the friction needed to hold that power, then it's just going to get wasted in the form of wheel spin. We fired up the torches and began quietly heating the blades. Ignoring the smell of burnt rubber, the cloying sweetness of the VHT, and the rapidly shriveling hair on our legs, we pushed through. Pass after pass. Foot after foot. Scraping rubber off the track, shoveling rubber into the burn barrel, dragging rubber onto the track. By the time we call first round of time trials, we stink. We are tired and sore, but there's no use talking about it because the day has started and there are big blocks rumbling in the staging lanes. Drivers are puffing on their cigarettes, warming their engines, checking their tire pressures. The glue is drying on the track, spectators are starting to show up, and the sun has begun to shine. I make whatever small talk I can while half-shouting over the engines. Helmets are pulled on, harnesses buckled, and finally the races begin. Photo by Blair Alderton, retrieved from the "drag strip employees" facebook group.